You’re not just a number with us. Norton’s Gas in Edmeston would like to welcome you to our growing family of propane, water heater, and furnace customers and thank you for this opportunity to serve you. We will make every effort to maintain our policy of old-fashioned personal service. We have served residents of Edmeston & Cooperstown and the surrounding areas with propane gas services for over thirty years. 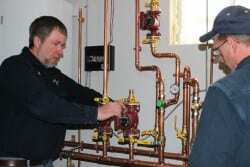 We also sell propane gas, hot water heaters, boilers, furnaces and more in Edmeston & Cooperstown. If you have an AFTER HOURS Emergency concerning one of our services like propane gas, water heaters or furnaces in Edmeston and Cooperstown, please do not hesitate to call us at 1-800-277-3627 and our on-call technician will be contacted immediately. Over the years we have established valued friendships with many of our loyal propane service customers in Edmeston and Cooperstown, so we hope you will never feel as if you are “just a number” with us. Stay warm with a custom tailored plan just for you.